Explore and investigate four simple lab experiments on the topic of ‘gravity’. Drop a ball from an alien UFO to study free-fall, fire a canon projectile and observe how balls interact when they oscillate and collide. Throughout all of the investigations the user is free to explore the lab equipment in anyway they wish, there are no strict directions. The nature of the animations is as close to real life as possible. Any experimental conclusions can be based on observing the changes that are noticed as well as taking measurements. The first experiment is based on free falling objects and allows you to alter the location to observe the motion of the objects from the Earth, to the moon, Jupiter or Mars. Compare the acceleration due to free fall on these cosmic bodies as well as changing the size of the mass that is falling. 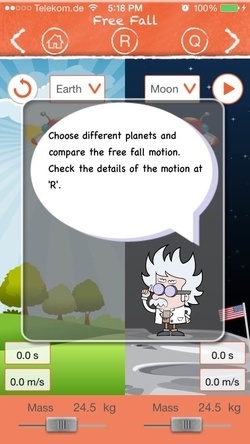 By tapping the ‘results’ icon a set of data for each free-fall is displayed so that the distance, time and velocity can be further analysed. 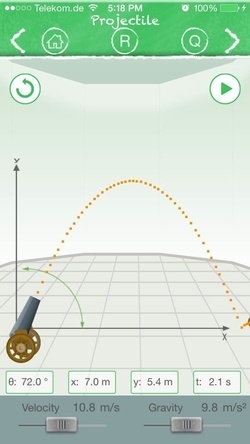 In the second experiment you control a canon by changing the launch angle. The theme of this investigation is projectile motion and the initial velocity, angle and gravity can be altered. Again there is the option to collect data from the virtual experiment and this allows the user to investigate the horizontal and vertical components of the motion. The oscillations experiment looks at the motion of a ball inside a half pipe with the possibility of changing friction and gravity. An extra ball can be added to the experiment to observe collisions, both inelastic and elastic. The final investigation is based on a simple pendulum that can be turned into a ‘newton’s cradle’ by adding more pendulums side by side. For both of the oscillations and pendulum experiment a clock icon can be used to record time period. Along with exploring the experiment set ups, each lab has a short quiz linked closely to what has been observed. There are 12 multiple-choice questions in sets of four that become increasingly difficult. As well as using the experiment to solve these questions there are some supporting notes for you to study. The information in the notes use scientific terms, mathematical formula and labelled diagrams. 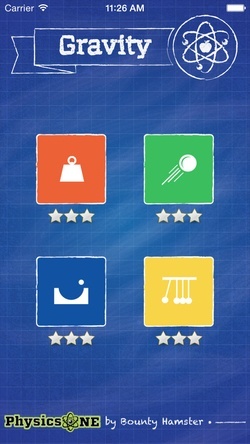 In general, the app is simple to navigate with obvious icons to direct you throughout the different sections. The graphics are neat and colourful, and the occasional sound effect will match an animation on the screen. One of the best features of the layout is the ability to move easily between answering quiz questions to experimenting with the lab equipment and reading the study notes. This helps greatly with finding the answer to the questions by applying what has been learnt. Rather than just thinking about the answer you can actually prove it with the lab equipment. Another very useful feature is the ability to use the data recorded in each of the experiments for further analysis. Students can use this data to draw graphs or input into equations. The developer is hoping to add more topics using this same experiment format and there will most like be updates for this version. This is a free app and is mostly appropriate for students of mathematics and physics who are 14 years of age or above. With the first application of our upcoming PhysicsOne educational apps, we want you to learn through playing. Physics can be fun when understanding concepts through games. 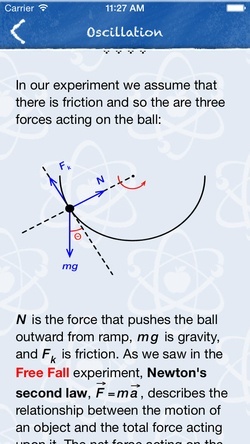 Gravity currently covers four experiments, free fall, pendulum, oscillation and projectiles. 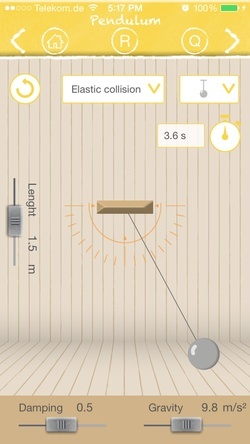 With more experiments coming and a set of increasingly difficult quizzes to check your understanding, this app forms a solid base to explore the concept of gravity. Well written summaries are also provided for a more in depth understanding of the theoretical aspects of each experiments.